This inherent duplicity is the cause of conflicting critical accounts. Furthermore, it engenders a fundamental alienation from the material contexts of digital knowledge production. Reading digitally takes place, in part, at quantum scale, beyond the reach of humans senses. Clandestine forces of capital and control subsequently contest such newly found microscopic expanses, thus limiting the scope of possible interpretive activity. Alienation ultimately threatens critical disempowerment. Laminate text is meant to name a structure by which a singular inscription fractures to occupy multiple surfaces and topographies. In this essay, I offer a media archaeology of that structure—that is to say, a history of laminate text coming into being. It proceeds in three parts, after brief theoretical and methodological discussions. In the first layer or “sediment,” we will observe the admixture of natural language and control code, meant for machine consumption. The second is characterized by its increasing opacity: inscription becomes inaccessible to human senses. Finally, a layer of simulated inscription is laid down to restore some of the apparent plasticity lost in the process of lamination. Allow me to begin with several initial, theoretical observations on the specificity of digital inscription. Little separates ink from paper in print. Ink permeates paper; the conduit embeds into its medium on a molecular level, altering it permanently in the process. The amalgam of ink and paper thereafter entails specific material properties and their related affordances. What the medium is relates to what can be done with it.3 A book printed on high-quality acid-free paper can remain inert for decades and sometimes centuries. I do not mean to restate a fallacy: print is emphatically not a totally stable medium. It is however comparably more stable than magnetic storage and less so than stone etching. At the very least, readers expect print materials to retain their shape as a document passes from one pair of hands into another. Interpreters of texts usually can (with some effort) make certain to find themselves, literally, on the same page, ensuring that their discussion concerns roughly the same piece of writing. The architecture of contemporary computational media—screens, hard drives, and keyboards—cannot sustain the assumption of fixity. Electromagnetic inscription occupies several available surfaces at once. It exists on screen, itself a composite of glass panes and liquid crystal, and “in memory,” as manifested in the arrangement of silicon and circuitry. The word is in the wires. When reading digitally, on a personal computer for example, the distance between these localities may extend a few inches, enough to cover the space between screen and hard drive. In other contexts, when viewing text on a commercial “electronic book reader,” that space may span continents. Stored data are transmitted over vast distances, between content “owners” and its “users,” who hold only a temporary right to peruse, limited in scope to specific timelines and geographies. An electronic book borrowed from the New York Public Library may be stored in the city or in New Jersey perhaps, on rented library servers. It vanishes from my devices when the terms of my book borrowing expire. I cannot immediately localize such a text with any precision: I know only that it sometimes appears on my screen. This unwieldy shape is the source of my puzzlement and an occasion to dwell in the discomfort of reading electronically. The digital sign stretches, elongates, and fractures across diverse material strata, subject to distinct local affordances. In some real sense it occupies multiple regions, jurisdictions, and time zones, with segments passing through New York, North Virginia and Ohio; Mumbai, Seoul, and Singapore. It is concurrently onscreen and off. Digital texts do not always behave in a way one would naturally expect. They engender spooky action at a distance: unsaved drafts, ghost typing, misfiled documents that forever disappear into the ether. They are somewhere, “in storage,” just not where I can find them. A simple act of erasure on screen, as when one backspaces over a word written in error, signifies a comparable action in print. The erasure is a metaphor, however. On disk, it conveys an entirely new set of connotations, not congruent with the action implied on screen.4 The incongruence between what you see and what you get can be benign. Readers and writers are often interested in handling surface representation alone, on the level of words and ideas. In this way, I sometimes tell my students: “I don’t care what edition of the assigned novel you purchase. Read any of them and we will figure out the page numbers later.” In other contexts, our inability to perceive the mechanics of inscription at depth severely undermines critical acuity. Imagine for example a scholar or a journalist who needs to redact unpublished materials in order to protect her sources. Surface, metaphoric erasure is insufficient for these purposes. Words erased on screen persevere through deeper structures on disk and among remote servers, making them susceptible to malicious breach or state-sponsored surveillance. To guarantee anonymity we want to destroy all copies of a text, literally not just metaphorically. But how and where? The affordances of laminate text depend not only on the medium, but also on the contexts of its reception. The same “source text” may be transformed according to its geography or the identity of its reader. As texts change hands they change themselves. A digital document may respond to a reader’s location, gender, age, ethnicity, or immigration status. Think of an online newspaper, where the very composition of headlines and stories is routinely tailored to individual readers. Such dynamic inscriptions contain rules of their own transformation. Content and code intertwine to produce an amalgamated artifact, designed for remote content control. An electronic “online” book implies a socialized environment, even when consumed in intimacy. Friends, advertisers, censors, and agents of surveillance are always potentially present, in part because digital text is in perpetual motion: moving past and through multiple infrastructures on the way to the iris. The chain of textual transmission is difficult to reconstitute. Governments that monitor reading habits by judicial means prosecute those who express opinions contrary to the reigning ideology. More insidiously, mechanisms of “soft” censorship can be encoded into the fabric of the laminate itself, through technologies that outright prevent prohibited ideological formations from appearing on screen. Unlike those censored by an explicit edict, readers under the reach of remote, algorithmic governance are not immediately aware of the control mechanisms structuring their everyday interpretive experience. They are left instead with a rough remainder of an imposed identity. A dynamic text has the power to determine its audience: a man will be interested in cars and women, an Eastern European in jewelry and Adidas shoes, an inmate or otherwise an enemy of the people, in a blank page and a home visit from your friendly librarian. Several parallel literary and media archaeologies were formative in my approach to thinking through the history of laminate inscription. The specter of Friedrich Kittler haunts many studies at the intersection of literary theory and media history, including this one. Kittler’s legacy is complicated however by his sometimes fatalistic pronouncements. “Under the conditions of high technology, literature has nothing more to say,” he wrote in the conclusion of Gramophone, Film, Typewriter.6 Katherine Hayles, Lori Emerson, Lisa Gitelman, Matthew Kirschenbaum, and others have commenced the patient task of mapping the material specifics of these changing conditions.7 Their efforts provided a much-needed materialist corrective of scholarship that initially emphasized the metaphysics of new media. Yet, the materialist perspective should not be overstated. Writers of a previous generation, such as Michael Heim and Pamela McCorduck, captured an important phenomenological insight when they referred to the “ephemeral quality” of electronic text, calling it “impermanent, flimsy, malleable, [and] contingent.”8 Electricity is truly a mercurial medium. Inscriptions on screen really do flicker and disappear at the loss of power. Our mistake is to treat digital text in analogy to print, conceived along a singular, two-dimensional plane. The concept of laminates, which I borrow from geology, helps reconcile a discrepancy that characterizes the two conflicting traditions in the study of new media. I further use the concept of “stratigraphy” literally, in contrast to media “archaeology,” where the spatial terms are used in their more evocative, metaphoric sense.10 The art of analyzing sedimentary rock layers dates back at least to the geological observations of the seventeenth century Danish scientist Nicolas Steno, later extended by John Strachey in his Observations on the Different Strata of Earths and Minerals (1727), and to the geological cross-sections of William Smith and William Maclure, who drew beautifully detailed cross-sections of British and American landscapes [Figure 1]. Stratigraphy is an apt borrowing when applied to the history of computer technology, where the various layers of historical development are often extant on one and the same device. In this manner, the legacy of machine alphabets such as the Morse and Baudot alphabets is still present on modern devices through the American Standard Code for Information Interchange (ASCII) and Unicode Transformation Format (UTF) conventions. A “conversational,” text-based model of human computer-interaction developed in the 1960s coexists with the later, graphic-based “direct-interaction” modes of interaction in the innards of every modern mobile phone, game console, or tablet.12 The same can be said about “low-level” assembly languages, continuously in use since the 1950s alongside their modern “high-level,” strongly-abstracted counterparts. First: with the advance of telecommunications, we observe the increasing admixture of human-readable text and machine-readable code. Removable storage media such as ticker tape and punch cards embodied a machine instruction set meant to influence a mechanism, which in turn produced human-legible inscription. Unintelligible (to humans without special training) machine control code was thereby mixed with plain text, the “content” of communication. The two data streams converged in transmission, and then diverged into separate reception channels. An encoded message could at once mean “hello” to a human recipient, and “switch gears,” to a machine. Second: whereas ticker tape and punch cards were legible to the naked eye, magnetic tape, a medium which supplanted paper, made for an inscrutable substance, inaccessible directly without instrumentation. In the 1950s and 1960s machine operators worked blindly, using complicated workarounds to verify equivalence between data input, storage, and output. Writing began to involve multiple typings and printings. Specialized magnetic reading devices were developed to establish correspondence between input, storage content, and output of entered text. The physical properties of electromagnetic inscription also allowed for rapid re-mediation. Tape was more forgiving than paper: it could be written and rewritten at high speeds and in volume. The opacity of the medium has also placed it, in practice, beyond human sense. Finally: the appearance of cathode-ray tube (CRT) displays in the late 1960s restored a measure of legibility lost to magnetic storage. The sign reemerged onscreen in a simulacrum of archived inscription: typing a word on a keyboard produced one sort of a structure on tape or disk and another on screen. The two related contingently, without necessary congruence. The lay reader-writer lost the direct means to secure a correspondence between visible trace and stored mark. An opaque black box of “word processing,” rules for transmediation, began to intercede between simultaneous acts of reading and writing. In what follows, I have selected three paradigmatic textual artifacts to mark this episodic history: Hyman Goldberg’s Controller, patented in 1911; the Magnetic Reader introduced by Robert Youngquist and Robert Hanes in 1958; and the Display System, introduced by Douglas Engelbart in 1968. Each represents a distinct sediment, which in aggregate comprise contemporary textual laminates. Together, these devices document a story of a fissure: the inscription appears at one plane to the eye, to the hand for editing in another, and yet elsewhere from a machine perspective, for storage and automated processing. The sign attains new capabilities at each stage of its physical transfiguration, from thought to keystroke, pixel, and electric charge: ephemeral in some aspects and enduring in others. The turn of the twentieth century was a pivotal period in the history of letters. It saw the languages of people and machines enter the same mixed communications stream. Language became automated through the use of artificial alphabets, such as Morse and Baudot codes. The great variety of human scripts could now be reduced to a set of discrete and exactly reproducible characters. The mechanization of type introduced new control characters into circulation, capable of changing machine states at a distance. Initially, such state changes were simple: “begin transmission,” “sound error bell,” or “start new line.” With time, they developed into what we now know as programming languages. Content meant for human consumption thereby parted from code meant to control electromechanical mechanisms. A text stream could “mean” one thing to a human interpreter and another to a machine one. Early remote control capabilities were quickly adapted to automate everything from radio stations to advertising billboards and knitting machines.13 These expanded textual affordances came at a price of legibility. At first, a cadre of trained machine operators was required to translate natural language into machine-transmittable code. Eventually, specialized equipment automated this process, removing humans from the equation. Hundreds of alphabet systems vying to displace Morse code were devised to speed up automated communications. These evolved from variable-length alphabets such as Morse and Hughes codes, to fixed-length alphabets such as Baudot and Murray codes. The systematicity of the signal – equal length at regular intervals—minimized the “natural” aspects of human language, affect and variance, in favor of “artificial” ones such as consistency and reproducibility. The fixed-length property of Bacon’s cipher, later implemented in the 5-bit Baudot code, signaled the beginning of the modern era in serial communications. Baudot and Murray alphabets were designed with automation in mind.14 Both dispensed with silent separator signals that distinguished character blocks in Morse code. Signal units were to be divided into letters by count, with every five codes representing a single character. Temporal synchronization was therefore easier to achieve, given the receiver’s ability to read the message from the start of a transmission. Fixed-length signal alphabets drove the wedge further between human and machine communication. Significantly, automated printing telegraphs decoupled information encoding from its transmission. The encoding of fixed-length messages could be done in advance, with more facility and in volume. Prepared messages could then be fed into a machine without human assistance. In 1905 Donald Murray wrote that the “object of machine telegraphy [is] not only to increase the saving of telegraph wire […] but also to reduce the labour cost of translation and writing by the use of suitable machines.”15 Baudot and Murray alphabets were not only more concise but also simpler and less error-prone to use. With the introduction of mechanized reading and writing techniques, telegraphy split from telephony to become a means for truly asynchronous communication. It displaced signal transmission in time as it did in space. 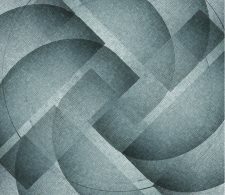 The essence of algorithmic control, amplified by remote communication devices, lies in its ability to delay execution. A cooking recipe, for example, allows novice cooks to follow instructions without the presence of a master chef. Similarly, delayed communication could happen in absentia, according to predetermined rules and instructions. A message could instruct one machine to sell a stock and another to respond with a printed confirmation. Just as perforated music sheets displaced the act of live music performance in time, programmable media deferred the act of inscription. Scribes became programmers. One could strike a key in the present, only to feel the effects of its impact later, at a remote location. Decoupled from its human sources, inscription was optimized for efficiency. Electromechanical readers ingested prepared ticker tape and punch cards at rates far exceeding the possibilities of hand-operated Morse telegraphy. Besides encoding language, the Baudot schema included several special control characters. The “character space” of an existing alphabet could be expanded by switching a receiving mechanism into a special “control mode,” in which every combination of five bits represented an individual control character, instead of a letter. In this manner, human content and machine control occupied the same spectrum of communication, eventually diverging into separate reception channels. Teletype technology automated the entire process of transmission, rendering punchers, pasters, and paperhangers obsolete. Operators could enter printed characters directly into the machine, using a keyboard similar to the typewriter, which, by that time, was widely available for business use. A teletype machine would then automatically transcode the input into transmitted signal and then back from the signal onto paper on the receiving end. Control codes thus occupied the gray area between “plain text” and “cipher,” in both the legal and technical sense of the terms that were governed by international treaties guaranteeing the passage of only those communications encoded in plain text. According to conventions, code was considered intelligible only when the schema for its decoding was available to the transmitter.18 Without such keys, a transmitted message was considered secret and therefore not subject to free passage across national boundaries. In practice, the proliferation of encodings and machine instructions had the effect of selective illiteracy, if not outright secrecy. Telegraph operators routinely used multiple cheat sheets to help decipher encoded messages. In this sense, telegraphy reintroduced a pre-Lutheran problem of legibility into human letters. To speak in telegraph was to learn arcane encodings, not spoken in the vernacular. A number of failed communication schemas consequently attempted to bridge the rift between human and machine alphabets. 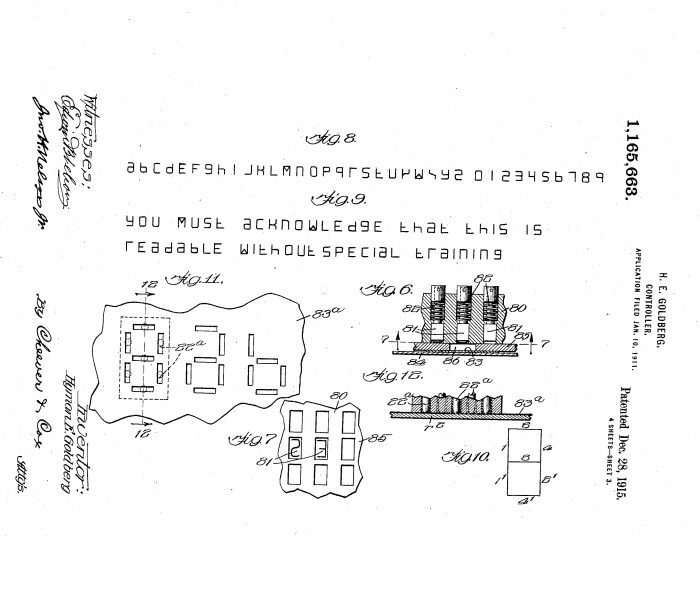 “You must acknowledge that this is readable without special training,” Hymen Goldberg wrote in the patent application for his 1911 Controller.19 The device was meant “to provide [a] mechanism operable by a control sheet which is legible to every person having sufficient education to enable him to read.” In an illustration attached to his patent, Goldberg pictured a “legible control sheet […] in which the control characters are in the form of the letters of the ordinary English alphabet.”20 Goldberg’s perforations did the “double duty” of carrying human-readable content and mechanically manipulating machine “blocks,” “handles,” “terminal blades,” and “plungers.”21 Unlike other schemas, messages in Goldberg’s alphabet could be “read without special information,” effectively addressing the problem of code’s apparent unintelligibility [Figure 2].22 At the surface of Goldberg’s control sheets, the inscription remained visible and un-encoded. It cut a perforated figure, rendered in English alphabet, which, incidentally, also effected a mechanical response. Whatever challenges punch cards and ticker tape presented for readers, these were soon complicated by the advent of magnetic tape. Goldberg’s perforations were at least visible through the paper conduit. The magnetic mark that followed was not only in code, but also illegible to the naked eye. Goldberg’s Controller and similar devices illustrated a growing concern with the comprehensibility of machine alphabets. One could hardly call early programmable media ephemeral. Anecdotes circulate about Father Roberto Busa, an early pioneer of computational philology, who in the 1960s carted piles of punch cards around Italy in the back of his pickup truck.24 Codified inscription, before its electromagnetic period, was fragile and unwieldy. Making an error on ticker tape or punch card entry required cumbersome corrections and sometimes wholesale reentry. Once mispunched, a card was near ruined, although it was still possible to fix minor errors with a bit of glue. Embossed onto ticker tape or punched into the card, early software protruded through the medium. Morse code and similar alphabet conventions left a visible mark on the paper. They were legible if not always intelligible. In applications such as law and banking, where fidelity between input, storage, and output was crucial, the immediate illegibility of magnetic storage posed a considerable engineering challenge. After the advent of teletype but before cathode ray tubes, machine makers used a variety of techniques to restore a measure of congruence between magnetic inscription and its paper representation. What was entered had to be continually verified against what was stored. Anticipating the popularity of twenty-first-century audio formats like podcasts and audiobooks, Fankhauser spoke of “tired and jaded” workers who would “sooth [themselves] into a state of restfulness” by listening to their favorite authors.31 Fankhauser saw his “electric writing” emerge as “clear” and “distinct” as “writing by hand,” “an absolutely legal and conclusive record.”32 His statements give contemporary readers a sense of the excitement that surrounded advances in early electromagnetic storage technology. In 1909, Fankhauser thought of magnetic storage primarily as an audio medium, which combined the best of telegraphy and telephony. Magnetic technology for data storage did not mature until the 1950s, when advances in composite plastics made it possible to manufacture tape that was cheaper and more durable than its paper or cloth alternatives.33 The state-of-the-art relay calculator, commissioned by the Bureau of Ordinance of the Navy Department in 1944 and built by the Computation Laboratory at Harvard University in 1947, still made use of standard-issue telegraph “tape readers and punchers” adapted for computation with the aid of engineers from Western Union Telegraph Company.34 It was equipped with a number of Teletype Model 12A tape readers and Model 10B perforators, using 11/16-inch-wide paper tape, partitioned into “five intelligence holes,” where each quantity entered for computation took up thirteen lines of code.35 Four Model 15 Page-Printers were needed to compare printed characters with the digits stored in the print register on ticker tape. The numerical inscription in this setup was therefore already split between input and output channels, with input stored on ticker tape and output displayed in print. Since it was impossible to transfer data from the slow-moving tape reel to the fast drums directly, information on tape was transferred first to an intermediary variable-speed drum, which could then be accelerated to match the higher rotating speeds of the more rapid internal storage drums for yet another transfer. The Mark III Calculator was further equipped with five printers “for presenting computed results in a form suitable for publication.” The printers were used to set the “number of digits to be printed, the intercolumnar and interlinear spacing, and other items related to the typography of the printed page.”37 Even a simple act of calculation on Mark III involved multiple materials, encodings, and movements across diverse media. In reflecting on these early supercomputers, one imagines the pathway of a single character as it crosses surfaces, through doorways and interfaces, gaining new shapes and temporalities with each transition. Readers not interested in additional case studies from the period can advance to the penultimate paragraph of this section, where I pick up on the theoretical consequences of magnetic stratification. The point of this history, already apparent in the Mark III case study, is to document the rapid proliferation of writing surfaces. Where we started with a single flat layer of ink and paper, we conclude with a literal palimpsest of inscriptions, evident in the schematics of mid-century computers and typewriters. 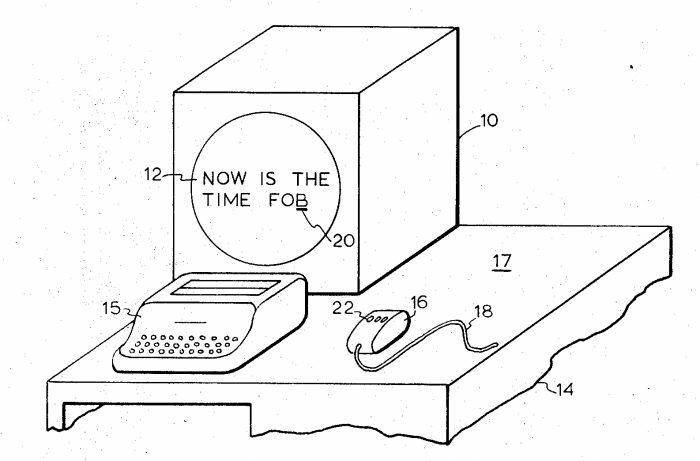 Devices like the Magnetic Reader attempted to reconcile a fundamental incongruence between paper and tape. Data plowed into rows on the wide plains of a broad sheet had to be replanted in columns along the length of a narrow plastic groove. Some loss of fidelity was inevitable. To aid in the transformation between media, the next crop of IBM Magnetic Selectric (MS) typewriters added a “composer control unit,” designed to preserve some of the formatting lost in transition between paper and plastic. Tape had no concept of margins or page width. The MS control unit could remember and change page margin size or justify text “in memory.” This was no easy task. 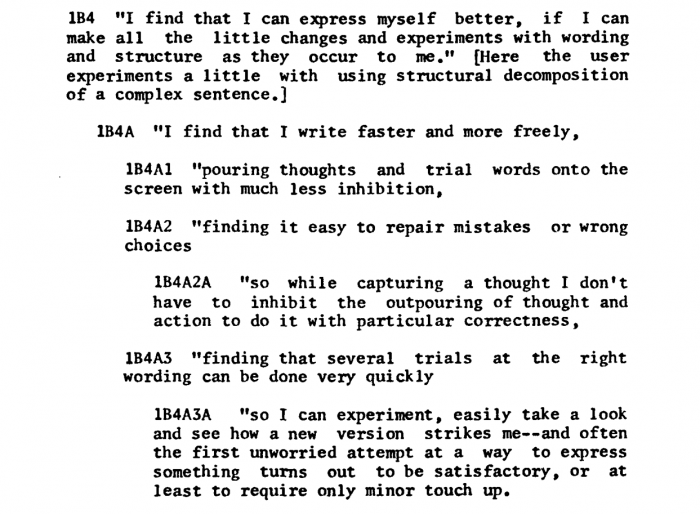 The original IBM Composer unit justified text (its chief innovation over the typewriter) by asking the operator to type each line twice: “one rough typing to determine what a line would contain, and a second justified typing.”46 After the first typing, an indicator mechanism calculated the variable spacing needed to achieve proper paragraph justification. The formatting and content of each line thus required separate input passes to achieve the desired result in print. The sign was fractured again for these purposes. IBM’s next-generation Magnetic Tape Selectric Composer (MT/SC) built on the success of its predecessors. It combined the Selectric keyboard, magnetic tape storage, and a “composer” format control unit. Rather than having the operator type each line twice, the MT/SC system printed the entered text twice: once on the input station printout, which showed both content and control code in red ink, and a second time, into the final “Composer output printout,” which collapsed the layers into the final typeset copy. Output operators still manually intervened to load paper, change font, and include hyphens. The monolithic page unit was thereby further systematically deconstructed into distinct strata of content and formatting. For a few decades after the advent of magnetic storage media but before the arrival of screen technology, the sign’s outward shape disappeared altogether. It is difficult to fathom now, but at that time—after the introduction of magnetic tape in the 1960s but before the widespread advent of CRT displays in the 1980s—typewriter operators and computer programmers manipulated text blindly. 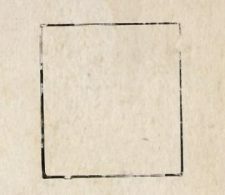 Attributes such as indent size and justification had to be specified before ink was committed to paper. Tape reels and control units intervened between keyboard and printed page. The “final printing” combined “prepared copy,” “control and reference codes,” and “printer output.”53 Historical documents often mention three distinct human operators for each stage of production: one entering copy, one responsible for control code, and one handling paper output. Researchers working on these early IBM machines considered the separation of print into distinct strata a major contribution to the long history of writing. One IBM consultant went so far as to place the MT/SC at the culmination of a grand “evolution of composition,” which began with handwriting and continued to wood engraving, movable type, and letterpress. “The IBM Selectric Composer provides a new approach to the printing process in this evolution,” he wrote and concluded by heralding nothing less than the “IBM Composer era,” in which people would once again write books “without the assistance of specialists.”54 Inflationary marketing language aside, the separation of the sign from its immediate material contexts and its new composite constitution must be considered a major milestone in the history of writing. The move from paper to magnetic storage had tremendous social and political consequences for the republic of letters. Magnetic media reduced the costs of copying and dissemination of the word, freeing it, in a sense, from its more durable material confines. The affordances of magnetic media—its very speed and impermanence—created the illusion of ephemeral lightness. Yet the material properties of magnetic tape itself continued to prevent direct access to the site of inscription. Magnetic media created the conditions for a new kind of illiteracy, which divided those who could read and write at the site of storage from those who could only observe its aftereffects passively, at the shimmering surface of archival projection. The schematics unearthed in this section embody textual fissure in practice. The path of a signal through the machine has led us to a multiplicity of inscription sites. These are not metaphoric but literal localities that stretch the sign across manifold surfaces. Whereas pens, typewriters, and hole punches transfer inscription to paper directly, electromagnetic devices compound them obliquely into a laminated aggregate. The propagation of electric signal across space necessitated numerous phase transitions between media: from one channel of tape to another, from tape to drum, from a slow drum to a fast one, and from drum and tape to paper. On paper, the inscription remained visible in circulation. It disappeared from view on tape, soon after key press. Submerged beneath an opaque facade of ferric oxide, inscriptions thicken and stratify into laminates. To recapitulate the exposed strata so far: in the first sediment, we saw the convergence of machine and human languages. A layer of electromagnetic storage supplanted ticker tape and punch card, in a proliferation of writing surfaces. Magnetic storage was “lighter,” faster, more portable and more malleable than print or punch. Ferric oxide became the preferred medium for digital storage. This new memory layer also lay beyond the immediate reach of human senses. It was “weighty” in another sense, difficult to access or manipulate. Screens added a much needed window onto an opaque layer of dense deposits. On screen, the topography of electromagnetic storage could be represented visually, obviating the need for double entry or frequent printouts. Screens interjected to mediate between input and output. The stratified complexity of a laminate medium was once again flattened, presenting a single, unified surface: for example, the “print view” of many contemporary word processors. This arrangement of devices took its present form in the late 1960s. Computers eventually became smaller, faster, cheaper, and more ubiquitous. However, they retain the same arrangement of technologies, which, until the advent of “direct” brain-to-computer interfaces, will continue to involve screens suspended above a layer of electromagnetic inscription. Writing, which this typist previously perceived as an ordered and continuous activity, subsequently was performed in a more free-form and disjointed way. The typist could delight in shaping paragraphs that more closely matched her mental activity. Screens restored some of the fluidity of writing that multiple-entry typewriters denied. Writers could pursue two thoughts at a time, documenting both in different parts of the file as one would in a notebook. Not constrained by the rigidity of a linear mechanism, they moved around the document at will. That feeling of physical transcendence—the very ephemeral quality of digital text—is tied directly to the underlying affordances of electromagnetic storage. Content can be addressed in memory and copied at a key stroke. The numbered paragraphs suggest a novel system for composition, reading, and recall. The writer describes her data storage units in terms of perceived, mental units which more closely track the flow of her thought, which similarly carry no penalties to changing one’s mind. I am struck by the distinctly phenomenological quality of the reported findings. The screen does not merely resemble a page – it creates a new way of thinking in the mind of the writer. The highly hierarchical paragraph structure, along with its repetitive refrain – “finding” and “I find that” – gives the prose a hypnotic drive forward. The cadence matches the experience of fluent discovery. It was an appealing vision, so long as it remained recursive. Engelbart’s group benefited from creating their own tools and methods. Engelbart also hoped that his system could be “transferred—as a whole or by pieces of concept, principle and technique—to help others develop augmentation systems for many other disciplines and activities.”65 His ideas about intellect augmentation have had a broad impact on knowledge work across disciplines. Outside the narrow confines of an active research laboratory his vision loses the property of self-determination. Contemporary readers rarely make their own tools. Augmentation enforced from without advances values and principles no longer comprehensible to the entity being augmented. To bring his system into being, Engelbart convened a group that through recursive self-improvement could lift itself up toward a smarter, more efficient, more human way of doing research. The group crafted novel instruments for reading and writing. They engineered new programming languages, compilers to interpret them, and debuggers to troubleshoot them. The system showed care and love for the craft of writing. It also introduced great complexity. “This complexity has grown more than expected,” Engelbart wrote in conclusion of his report to NASA.66 The feeling of transcendence that the anonymous typist described in using the system engaged a sophisticated mechanism. The mechanism was not, however, the primary instrument of intellect augmentation. Rather, enhancement lay in the process of designing, making, and experimenting with writing tools. The process was ultimately more important than its product. Engelbart wrote, “The development of the Bootstrap Community must be coordinated with the capacity of our consoles, computer service, and file storage to support Community needs, and with our ability to integrate and coordinate people and activities.”67 In other words, the development of the community formed a feedback loop with software development. It involved training, practice, critical self-reflection, and thoughtful deliberation. Modern word processors allow us to drag and drop passages with unprecedented facility. We live in Engelbart’s world to the extent that we routinely use technology created by his lab. But the vision of an empowered, self-experimenting computer user never quite materialized. Contemporary writers are bootstrapped passively to the prevailing vision of intellect augmentation. Engelbart’s research program thus left another less lofty imprint on the everyday practice of modern intellectual life. Text, which before the advent of CRTs was readily apparent on the page, entered a complex system of executable code and inscrutable control instruction. The material lightness of textual being came at the price of legibility: complexity has grown more than expected. 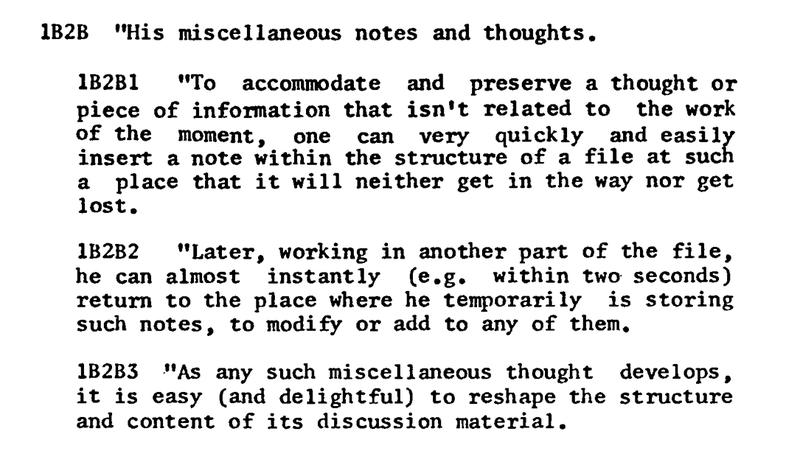 Short-lived screenless word processors of the early 1960s (as was the IBM MT/ST) were difficult to operate, because typists had no means to visualize complex data structures on tape. Screens helped by representing document topography visually, restoring a sense of apparent space to an otherwise featureless medium. Contemporary digital documents resemble pages onscreen. Screens simulate document unity by presenting holistic images of paragraphs, pages, and books.68 The simulation seems to follow the physics of paper and ink: One can turn pages, write in margins, and insert bookmarks. The underlying inscription remains in fracture. Simulated text does not transcend matter. Screens merely conceal their material properties while recreating others, more seemingly transcendent ones. The act of continual dissemblage – one medium imitating the other – manufactures an ephemeral illusion by which pages fade in and out of sight, paper folds in improbable ways, and words glide effortlessly between registers. In the rift between input and output, programmable media inject arbitrary intervals of time and space. Forces of capital and control occupy the void as the sign acquires new dimensions and capabilities for automation. Code and codex finally sink beneath the matte surface of a synthetic storage medium. Screens purport to restore a sense of lost immediacy, of the kind felt on contact between pen nib and paper as the capillary action of cellulose conveys ink into its shallow conduit. Patently the screen is not a page. A laminate page recreates print, just as it obscures the shape of a dimensional figure. To mistake this flat surface for the inscription in full is to preclude the analysis of mediation itself.